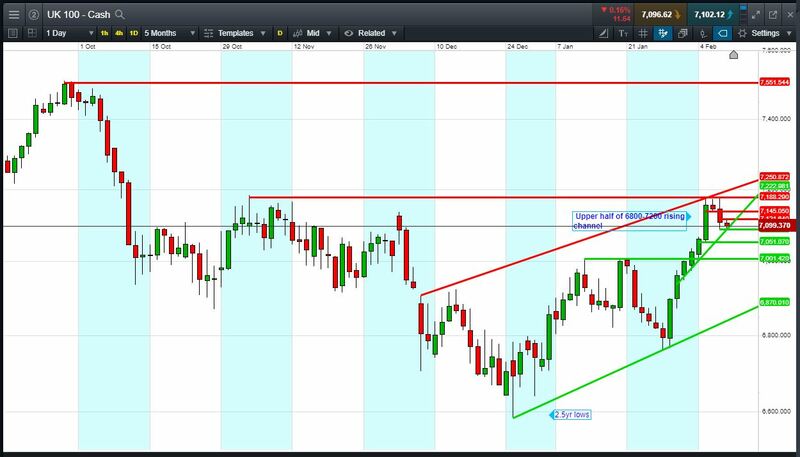 FTSE 100 called to open flat at 7095, back from 2019 highs of 7188 but, for now, still in the upper half of Jan’s 6800-7200 rising channel and holding Feb rising support at 7100. Bulls need a break above 7121 overnight highs to revive and extend Feb’s uptrend. Bears require a breach of 7090 overnight lows support to extend the pullback. Watch levels: Bullish 7125, Bearish 7095. Calls for an uneventful open come in spite of a bearish Wall St close, where trade worries resurfaced with President Trump saying he would not meet Chinese counterpart Xi until after the current trade war truce expires on 1 March. In a further blow to negotiations, Trump is said to be planning to ban all Chinese telecoms equipment (not just Huawei) from US networks. The US Dollar is maintaining a 6-day rally amid safe-haven demand, but the strength of the Greenback versus major peers is providing little direction for the UK’s Sterling, the latter buffeted by conflicting Brexit headlines and UK economic growth uncertainty following the Bank of England’s updated assessment yesterday. Company news this morning SSE cuts EPS guidance by 8-9%, unable to receive/recognise £60m contracted income from Capacity Market until next financial year; CAPEX unchanged at £1.7B, Considering demerger/listing of SSE Energy Services; reiterates FY dividend aim of 97.5p, +2%. FlyBe scheme document for recommended 1p/share cash offer from Connect Airways JV (Virgin Atlantic, Stobart, DLP) highlights EGM 4 Mar, effective date 11 Mar, cash settlement 25 Mar. Shaftesbury reports “robust” footfall, with occupiers reporting sales growth during holiday period. Signed £9.3m in rental deals since 1 Oct with rental levels, at or above end-Sept est rental values. Earthport recommends Visa’s improved 37p cash offer (+23% vs original 30p/share bid, a 397% premium to 24 Dec pre-offer price) which is higher than Mastercard’s 33p/share rival proposal. In terms of events, major data is decidedly lacking today, meaning markets may be more susceptible to any new Brexit headlines or updates on US-China trade negotiations. As for speakers, we have only the Fed’s Daly (6:15pm, centrist, non-voter), participating in a moderated Q&A at an economic forecast conference, and we have no major US corporates publishing quarterly results.